The initial effects of the creation of lawns with grass mixture can be seen after about two weeks, when the first soft layer of green grass is starting to grow on your new lawn. 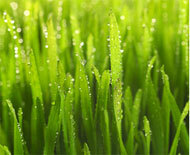 We choose grass mixtures in accordance to the specific requirements of the field – exposure, soil type, etc. and always ensure the selected mixtures have the needed quality certificates. The best time of developing new meadows is during the spring or autumn months, when the weather and the soil conditions are most favorable. The “First Support”, which includes initial mowing, is included in the bid proposal of the construction of each site. That way we make sure the grass we have planted will develop properly and will look good. Fertilization of the newly seeded grass is required.